Today's Draw: The Magician from the Minute Tarot. What amount of power do you believe you possess to change your life? What do you think your limits are in this regard? Do you ever actively think about conscious creation in your life? 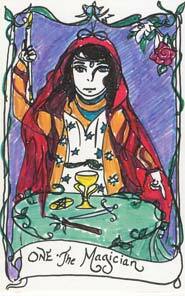 The Minute Tarot is all about speed-reading the tarot. So she's boiled the Magician down to one word—Manifest! Sooner or later that's what we all have to do, right? We can only strategize and plan and prepare and consider and AVOID for so long. Sooner or later we have to "do". We have to take the first step in the direction we want to go. It sounds easy, but the reason it's not is because it requires a leap of faith. It means risking failure. Being vulnerable. And putting it all on the line. I'm someone who can think the life out of pretty much anything before I actually make a valid move in the direction of getting it. On the other hand, the biggest moves I've made in my life have occurred with very little, or no, obsessive thinking beforehand—becoming self-employed, buying a house, pursuing a second career in tarot. It's a lot easier when you don't take the time to consider how many different ways you can fail. One of the best books I ever read about manifestation—and life, even—was Deepak Chopra's Seven Spiritual Laws of Success. In that book, it not only talks about visualizing what you want and taking a step in the direction, but it also talks about releasing your attachment to the outcome. I always like to add to anyone's "secrets" to manifestation, to wish for the right thing. Wish for a feeling or a general direction...being happy in my career...having a fulfilling career that helps others....stuff like that. In that context, releasing attachment to the outcome means to try and not define what you think that outcome will be. It also means that if you don't get the outcome you expected, to have faith because you may have gotten something better...or the direction you got may be a valuable stepping stone for something further down the road. See, god or the universe has a much bigger and better dream for you than you could imagine. So, assuming something doesn't feel wrong or dangerous, surrender in faith to what you receive and trust it's either answering your request or is leading to the answer. What it comes to is that being a powerful manifester does not mean that you're a powerful doer. In fact, Deepak Chopra also suggests taking the path of least effort. You have to try, but you have to leave room for god or whatever you believe in to do their part. No, manifestation is not about doing. It's about living in faith. It's about letting go and trusting. Surrendering. The Magician has all the tools he need to create anything he wants....earth, air, fire and water. But he also has a grasp on the higher power and knows that the magic that is abundant above, is just as accessible and abundant here on earth. The single most powerful tool we can have for our futures is faith that there is a higher energy we can tap into to create anything we want. Can you take that leap of faith? BTW, I recommend the Deepak Chopra book. It's a fast read. But for manifestation, I recommend anything by Mike Dooley. You can find his stuff at amazon or at tut.com.